Though my blog site is not too productive as compared to others which are SEO enhanced, but it had satisfied organic visitors for 5 years. I don't know how to interpret this views in my site which have reached to 761,145 as of this writing. Anyway, it is still going keeping with the time. RandomThoughts is an inspired title of my first column in our local newspaper, Negros Dailly Bulletin, a vigilant community newspaper in Region VI, Western Visayas, Philippines sometime in 1991. But later it was suggested by the editor, Pert Toga if I could change it. Then I changed it to Vibrations. Vibrations is still running in the said newspaper, but not in a regular basis anymore. 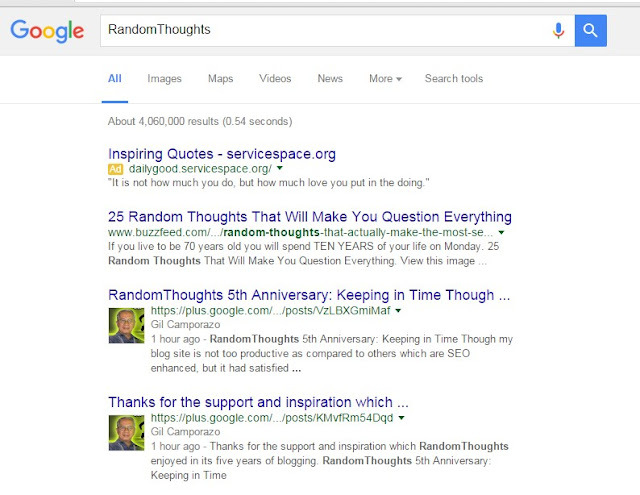 RandomThoughts has its ups and downs. 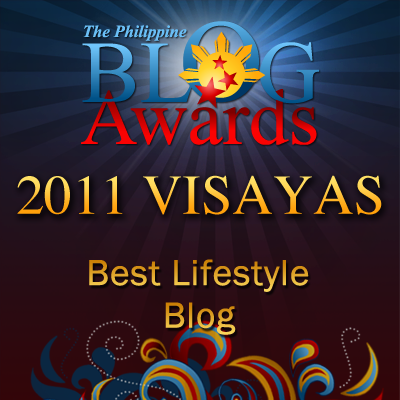 Out of its first circulation in the Internet for a year, it received an award from the Philippine Blog Award as the Best Lifestyle Blog Award in 2011 in regional category. As it runs independently by a sole owner/writer/blogger, RandomThoughts will be serving its readers, followers, and guests for their information needs, entertainment, news and commentaries and whatever comes along the way as it supplements the prolific thoughts of the blogger. And moreover... for those who keep on following this humble, simple blog site, RandomThoughts, I am expressing my humble appreciation for such support and inspiration you have given me. To those who in anyway, find this site suited for you news, ads, activities, my gratefulness is also expressed. To my friends, work associates, and to my family who understands my passion as a writer, I am so confident to stand and to continue working on this. Thank you. RandomThoughts 4th Anniversary: Could It Survive? Happy 5th Anniversary! Random Thoughts Blogger, Sir Gil...Mabuhay po Kayo! Happy anniversary Sir! I love reading your site because its real and straight forward. God Bless! Your stats is a testament that your blog is well followed. Congrats on another year. Congratulation and Happy Anniversary! It's hard to maintain a blog site but you manage to do it with flying colors. Happy anniversary to you and your blog. Congratulations and happy anniversary! That's a long time of dedication and I wish you never find the inspiration to keep writing. Congratulations on your 5th anniversary! I am happy you made it this far. Such an inspiration for new bloggers like me. Maligayang bati po sa inyong blog anniversary! I can feel your satisfaction that you have been widely read and trending on Google for your posts. Wow 5 years and its so fast. Congratulations and keep yourself busy plus keep writing. Wow, congrats on such great numbers, that is amazing and you should be very proud! What is your secret? Congratulations on your Blog Anniversary. Such amazing numbers indeed. Organic following is the best. Congrats on your 5th Year. I am sure you will influence a lot more readers. Congrats on maintaining a steady following even after 5 years! That's very difficult considering there are a lot of blogs now. Congrats. Hearty hearty congrats... That's impressive statistics. Wishing you all the very best for much more growth of your blog..
Congratulations on your blog anniversary and it needs a lot of effort and dedication. 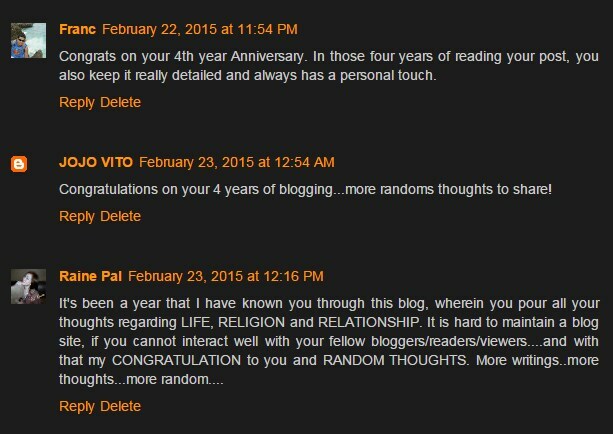 Happy Blog Anniversary! Keep writing and keep celebrating more and more. Great Efforts! 5 years is no joke! 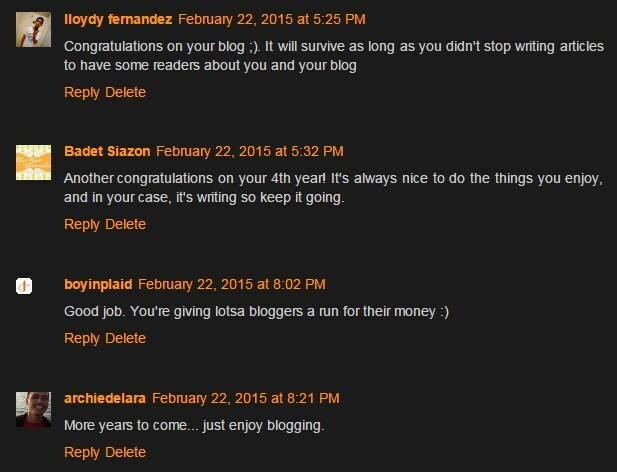 Congratulations and here's to more years of blogging for you! I'm pretty sure you enjoy it, it's one of the best outlets an individual can have. Thanks for the interesting posts you have posted throughout the months. 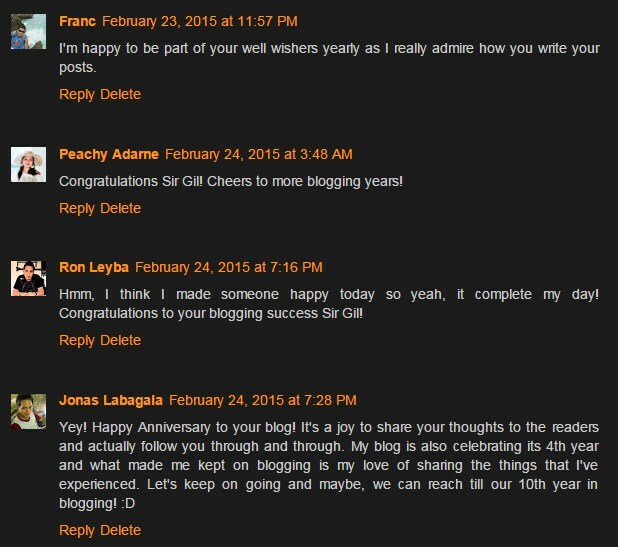 Congrats again Sir Gil, its been a while that I haven't visited your blog. Thank God you are celebrating your 5th year, so much things to share....more posts to read!